This fabulous antique Singing Bowl, believed to date from the 18th century, has a totally unique form and is the first of its kind I have come across in over 30 years of collecting. Apart from its unique shape it also features an unusual downward-sloping grooved lip, and an incised band encircling the inner wall. The fundamental note is a concert pitch third octave E (164Hz) when struck with a padded mallet, while the rim note is a nice middle Bb (469Hz) when played with a suede or wooden ringer. 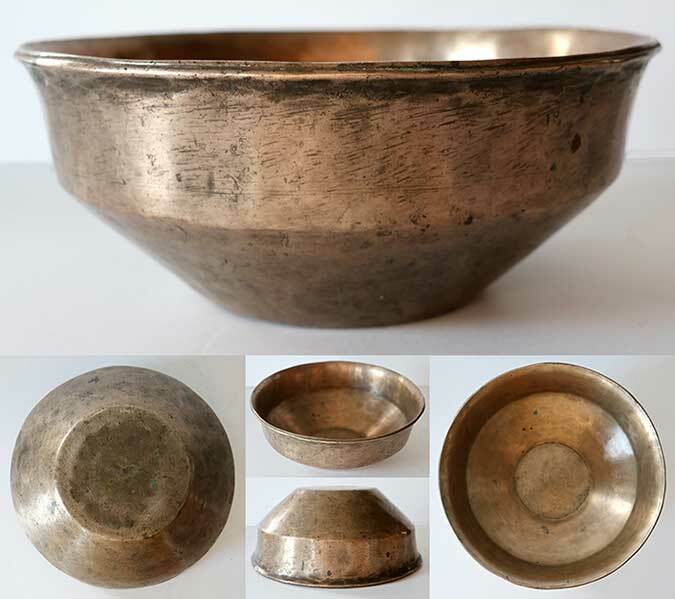 This ancient bowl and collectable singing bowl has been superbly crafted and is in excellent structural condition with a fabulous aged patina. One of my personal favourites!